Apex Fasteners is an Authorized Distributor for Apex Tool Group LLC, Apex Fastener Tools, Utica Torque Products, and Apex Universal Joints. 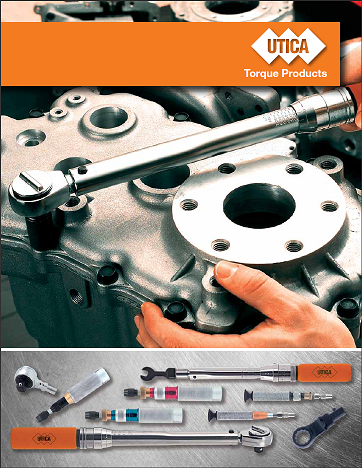 Utica products offer high quality solutions for your torque applications. Utica products add value to the assembly process by enabling you to assess, control and improve product reliability, which leads to customer satisfaction. Whether the application is cellular phone assembly involving fine threaded screws or an automotive assembly operation fastening bolts, Utica torque products are the right choice. All Utica screwdrivers feature aluminum housings to reduce weight and maximize durability. Six standard models are available for light duty torque applications including general electronic and computer assembly. Two miniature models offer reliable fastening of the very smallest of applications such as cellular phone assembly. Utica click style torque wrenches are built to exacting standards to maintain maximum accuracy. Only top grade materials are used in Utica click wrenches. Working parts are heat-treated to increase durability and service life. Each wrench is tested with equipment traceable to NIST standards. Because of a high commonality of parts, the procedures for calibrating Utica click wrenches are the same from the smallest to the largest wrench in their product offering. This saves the operator time and the expense of developing specific procedures for different wrench sizes.